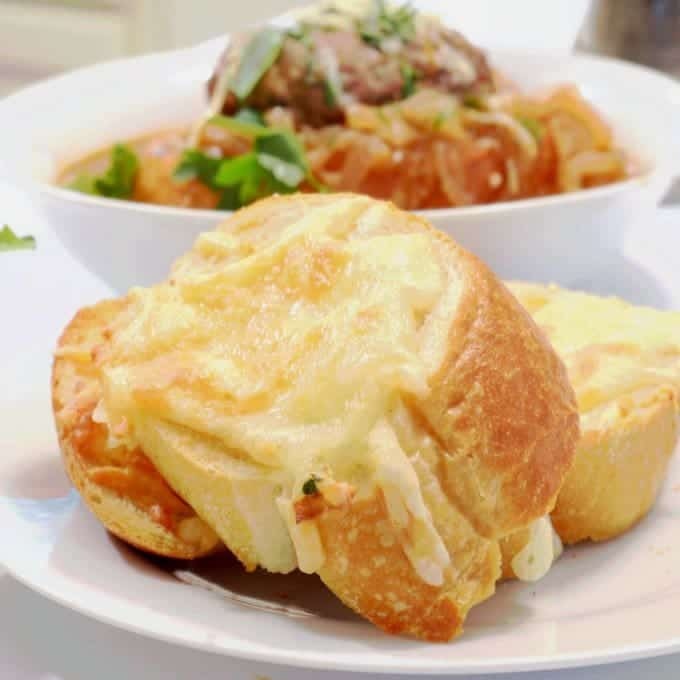 This French Onion Salisbury Steak Recipe & Cheesy Garlic Toast takes two classic dishes and combines them into a single and delicious meal. It’s easy to make and very affordable. You can put this meal together for well under $15 and have enough for leftovers as well. Not only is this a delicious meal to put together, it’s also a fun one to do even if you don’t really care to putz in the kitchen. Why, you are probably asking? There are elements of genuine cooking involved in this one! The beef is dredged in flour, it is eventually braised and then finished off in a red wine and beef broth-based sauce. Sounds pretty serious, doesn’t it? Don’t be fooled, like most thing that taste great, this one is very simple to put together. 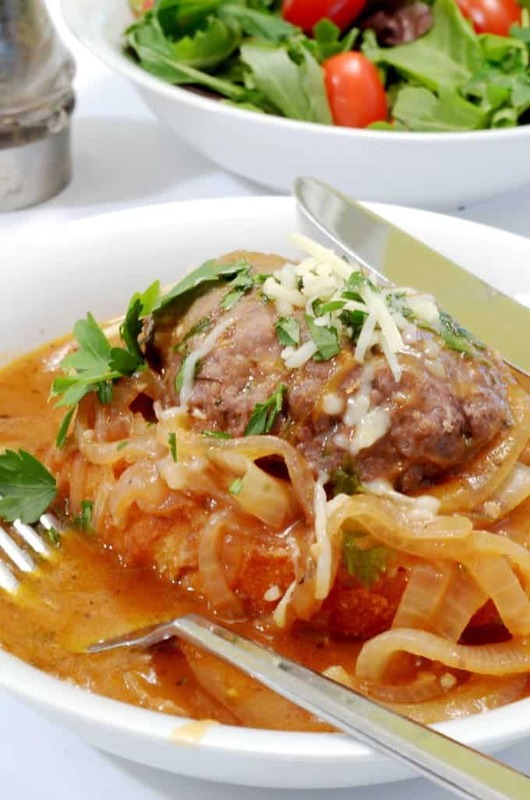 Importantly, this French Onion Salisbury Steak Recipe comes with a bonus: Cheesy Garlic Toast. Like the rest of the components of this dish, it’s super simple and just as delicious. Grab a loaf of artisan bread from your grocer, spread a little garlic and butter on it, top it with some cheese and voila! Take my advise with this bread and make more than you’ll need for the main dish. It makes a an addictive addition to chew on, before, during and after the main event. We grabbed this French Onion Salisbury Steak Recipe & Cheesy Garlic Toast from one of our favorite cooking mags, Cuisine at Home. 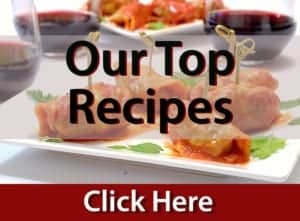 It’s not the first time that we have featured recipes form this publication that is full of practical and every day recipes. Among some of our recipes that came from Cuisine at Home are our Hero Salad and Chicken Meatball Sub Casserole. 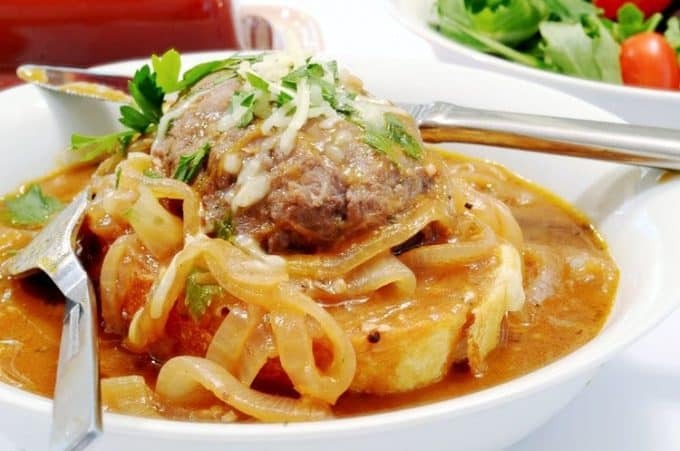 We think this French Onion Salisbury Steak Recipe & Cheesy Garlic Toast fits right in with the others. Combine chuck, parsley, scallion, salt, and pepper. Divide evenly into 4 portions and shape each into 3/4–1"-thick oval patties. Place 2 T. flour in a shallow dish; dredge each patty in flour. Reserve 1 t. flour. Heat 1 T. oil in a saute pan over medium-high heat. Add patties and saute 3 minutes on each side, or until browned. Remove from pan. Add onions and sugar to pan; saute 5 minutes. Stir in garlic and tomato paste; saute 1 minute, or until paste begins to brown. Sprinkle onions with reserved flour; cook 1 minute. Stir in broth and wine, then add the salt and thyme. Return meat to pan and bring soup to a boil. Reduce heat to medium-low, cover, and simmer 10 minutes. Serve steaks on Cheese Toasts with onion soup ladled over. Combine butter, garlic, and paprika, and spread on one side of each slice of bread. Combine cheeses and sprinkle evenly over butter. 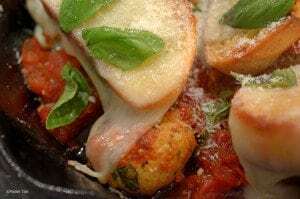 Bake until bread is crisp and cheese is bubbly, 10–15 minutes. Yum…one of my favorite meals. 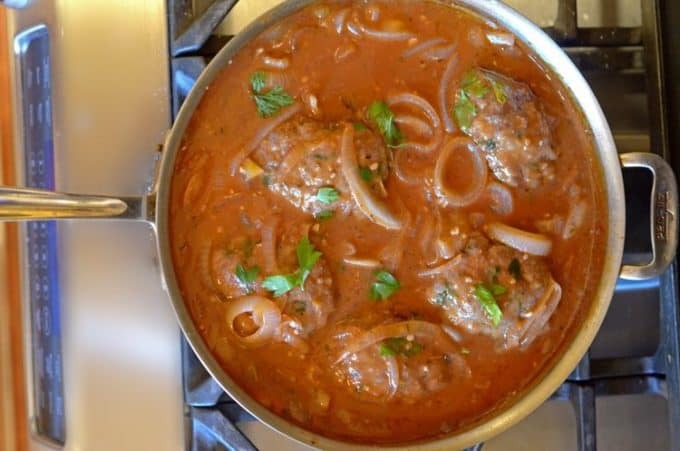 I have a similar recipe that I make and I make the beef into meatballs instead of patties. It required a careful eye so as to not overcook the beef but once you got it down it’s easy to make. A favorite winter meal. Those onions look amazing! What a great idea. I haven’t had salisbury steak for so long. Reminds me of comfort food from my childhood. Such a perfect combination!! That cheesy toast…OMG!! Oh I want to eat this through the screen! I love French onion soup with cheese on toast. SO good. This is all the elements of a comforting meal and I want to dive in. Wow! this looks amazingly delicious! So flavourful and wholesome dinner! Thanks for the commments, Priya. We enjoyed this! This looks so yummy it is making me want to run out to the grocery store to purchase the items to make it. Glenda, that was my intent. 🙂 Thanks so much for you comments, I hope you try this! Dan, this recipe looks amazing! I’d love this toast for breakfast…. and lunch… and dinner. Simply amazing all-round FIVE STARS!! Levan, thanks so much for taking the time to stop by and comment; I think you would truly enjoy this dish! Looks out of this world! I can’t wait to give this wonderful recipe a try. You really have taken Salisbury Steak to new heights! My family will love this. Thanks very much, April. It’s so nice to hear from you! What a delicious looking dish Dan! Pinned and shared! Wow! 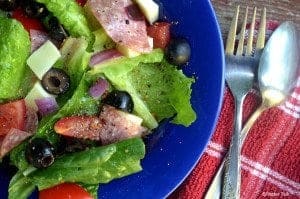 I was hooked at the “French” part of the title 😉 and by the end of this post, I’ve determined that this shall be one of my dinners this week! I love that the beef is cooked in a wine-beef broth; I can just imagine how much flavor is infused in it from that and the onion soup. It really just seems like such a lovely, comforting dish to enjoy after a day of work. I love this recipe! Thanks so much for stopping by, Beeta! As I may have alluded in the post, this is a great recipe for “pretend” chefs, like myself. 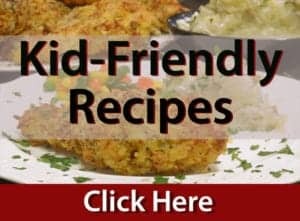 It employs some mini-versions of common techniques and ingredients that are common to more seasoned kitchen professionals. Importantly, the end product tastes pretty wonderful, as you’ve suggested! I hope you try this one, it’s simple and delicious. I would really enjoy both the French onion Salisbury steak and the cheesy garlic toast. They both looks so delicious. Thanks, Dawn. And yes, I think you would enjoy both! I haven’t had salisbury steak since I was little. It immediately brought back fond memories and I look forward to making this recipe. Thanks for the comments, Renee. I hope you try this because I think you will enjoy it! 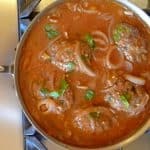 I love this family style recipe! It’s terrific. Thank you Patty; wish you could have been here for this one! Now this is my kind of dinner, nicely done and all the right flavors. 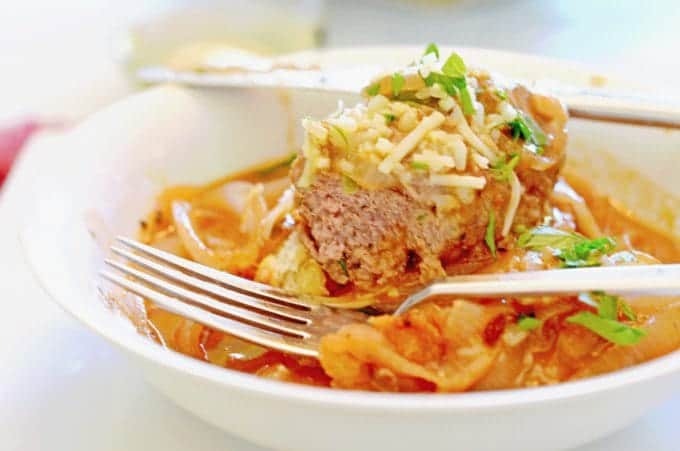 This onion soup meets salisbury steak is a great combo! Thanks so much, Kevin! It’s always nice to hear from you! This looks amazingly fantastic! French onion soup has always been a favourite of mine and I love that you’ve made it more hearty in this recipe! Thanks Cindy; it’s always fun to try mixing up a couple of standards and coming up with an entirely new dish!